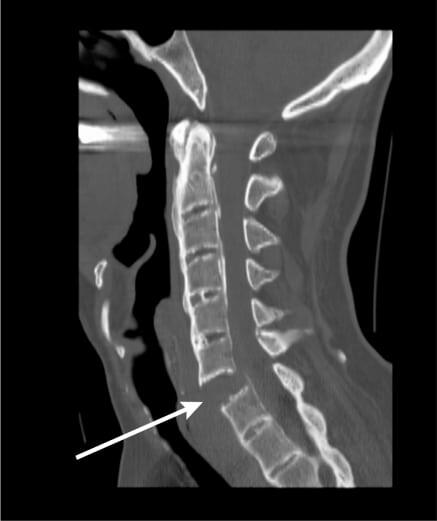 Cervical spine fracture was associated with a high mortality risk among hospitalized patients with ankylosing spondylitis (AS), analysis of data from a national U.S. sample found. Cervical spine fracture with spinal cord injury had the highest risk of death from any cause in these patients. Even without accompanying spinal cord injury, cervical spine fracture remained significantly associated with in-hospital mortality. “The high rate of mortality in AS after cervical spine fracture highlights the importance of prompt and specialized care for these patients,” the authors wrote. Studies have suggested that mortality rates are increased among patients with AS, but the specific causes of death have been unclear. Cervical spine fractures are a recognized complication of AS, and the estimated lifetime risk for vertebral fracture in these patients is 14%. One study reported mortality rates following hospitalization for spinal fracture among patients with AS to be 6.4% to 11.3%. To further examine the possibility that spinal fractures are associated with the increased mortality risk among AS patients and to identify other possible causes of death, researchers analyzed data from the Healthcare Cost and Utilization Project sponsored by the Agency for Healthcare Research and Quality. This database includes information on 8 million hospitalizations annually, and is considered a 20% representative sample. ICD-9 diagnoses that were most commonly associated with mortality were cardiovascular disease in 55%, sepsis in 30%, and cervical spine fractures in 16%. Mortality was 11% among patients with cervical spine fractures, rising to 24% for those who had spinal cord injury along with the bone fracture. The researchers also performed a secondary analysis in which they compared admissions for all cervical spine fractures, in patients with and without AS. In this secondary analysis, an increased mortality risk was seen for those with AS, confirming the spine disease as an independent risk factor for mortality. Falls were the primary mechanism of injury among AS patients with cervical spine fractures, in 62%, whereas in the non-AS group similar percentages had fractures related to falls (35%) and motor vehicle accidents (37%).